Fellow Ghanaians I am here not as a spectator nor a mere follower of the crowd but as a full participant and strong contributor for the betterment to the building of the society of Ghana. As you read this piece of article you are therefore welcomed to my small 'chambers', entitled "A Call For Change" where an effective but efficient change begins. It is my fervent hope that you do not read for reading sake but you read to have a renewed mind that will have a positive transformation that will reflect the general mentality of people around you. Also with all due respect do not read and keep the information and knowledge to yourself alone but rather introduce more friends, relatives and love ones to have a go at what is going on here in order to spread the hidden truth. I am popularly known among Ghanaians as OSAMAFO KWASI BROTHER, the founder and leader of AKANISM Movement, an organisation that is poised to defend and promote Ghanaian culture and traditions wherever and whenever possible. And Osomafo from the million-year-old generation of Nananom to date, starting from Sumeria, Komante, (Egypt), Asrae (Israel) through the great empire of Gyene (Ghana) and finally to our present Sikaman. To these I say well done (ayeekoo) to all levels of Nananom right from Nana "Nya Amen/Amenet" (Nyame), the great ancestors and our natural rulers (Nananom Ahenfo) for their unfading love and fearless leadership role they played in planting us all on the land peculiar and special to all humans and every land under the sun. Change can be defined as an act or process of doing existing program/performance etc in a different way or direction that can result positive or negative returns. It is a transformation that will come with pros and cons on the society/organisation/people/ locations in question. 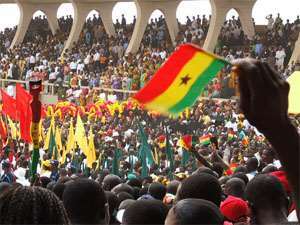 Fellow Ghanaians we all hope to see our country improved in all areas of life so as to have comfortable lifestyle to live a better life that will promote longer and enjoyable life. However, for such improvement to occur there must be change of many things in our, either collective or individual, destiny to achieve better and lasting success that will be seen and felt by all standard of life in our generation and the generations to come. I must say that in my objective point of view, generally, Ghana needs serious overhauling from archaeology to Zoology. That is to say everything about Ghana needs a great and massive change. And this massive change can never be manifested on a silver platter. With hard work, a sense of innovation and a lot of determination positive change can be achieved through the revealing and practical knowledge of our own stories that will enhance the welfare and well being of all generations. A change of general behaviour etc etc that must benefit every citizen including the unborn. These areas will be examined into details topic by topic in my next articles. Beloved this Call For Change embraces every Ghanaian from the north end to the south end, and east to west without any political or religious affiliation or tribal barrier to prevent any potential contributor(s) to put in the maximum efforts for collective success. It is a call to bring to mind our full potential and high level of capability to get the best from our own people and our environment at large. A change that will seek to provide and protect, produce and progress all forms of life that are confined in the borders of the country whose citizens must be identified and recognised in this modern world. The change that must be effective in order to have positive and lasting results that must be witnessed even by the generations to come in all sphere of human dealings. Here in my small 'chambers,' many are the things that are yet to be discussed to effect the positive change that we deserve to obtain in our rightful position. Many are the hidden secrets that would be revealed to put many Ghanaians in the right direction, a better position to renew the positive mentality of achieving higher goals. In this Saturday weekly presentation many are the things that are yet to be known to elevate our conscience on many circles of human ability therefore I will not delve deeper into any form of introduction of any topics today that can create boredom to my readers but rather short introduction to create the necessary awareness of the revival of mental consciousness. Stay focused and take good care of your health.